Born in 1962 in Ji’an, Jiangxi Province, China, now Lives and works in Shanghai, China. Liu Jianhua is one of China’s best known sculptural and installation artists. Working primarily in porcelain and mixed media, Liu was raised in Ji’an, Jiangxi Province. He spent 14 years living, learning and working in Jingdezhen, a city renown for its porcelain industry. 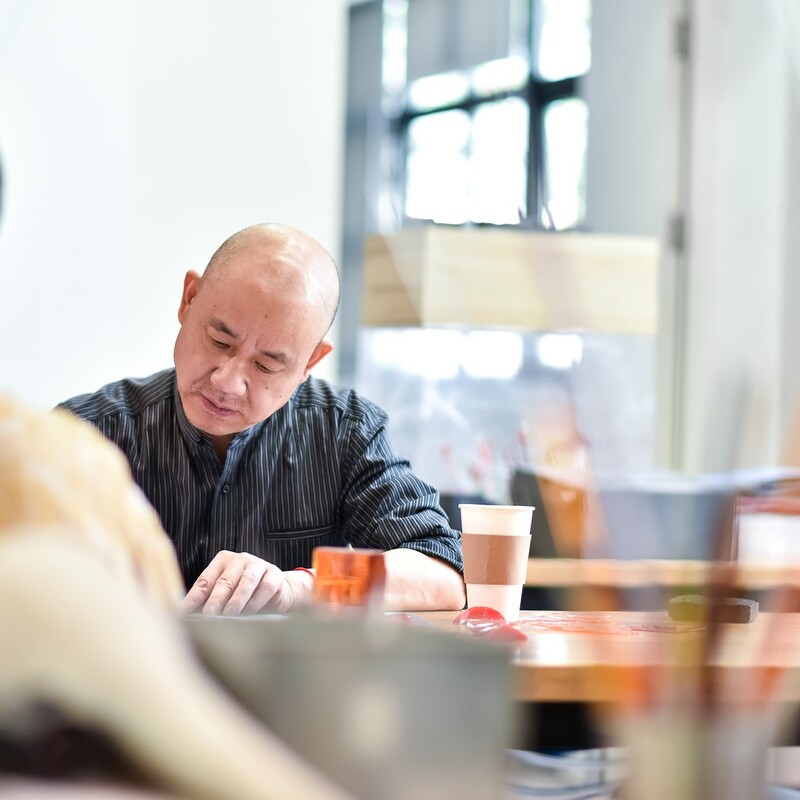 He graduated in Fine Art of Sculpture at the Jingdezhen Ceramics Institute in 1989, and started his own experimental practices. Liu’s works reflect the economic and social changes in China as well as the problems that emerge. His Regular Fragile series, first shown at the Chinese Pavilion, Venice Biennale in 2003, is composed of porcelain replicas of familiar objects that value appearance and symbolism over function. While his previous focus was on the social issues in China as the result of globalization, since 2008, he explored new grounds with works like Untitled. His “no meaning, no content” approach signals a new direction of contemporary art creation. Liu Jianhua’s works have been exhibited in The 57th International Art Exhibition“Viva Arte Viva”, The 6th Echigo-Tsumari Art Triennaie, The 8th Shenzhen Sculpture Biennale, The 1st Kiev Biennale of Contemporary Arts, The 14th international Sculpture Biennale of Carrara, 17th Biennale of Sydney, Vancouver Biennale 2009-2011 (Canada), The 3rd Nanjing Triennial, 2nd Moscow Biennale of Contemporary Art, The 1st Singapore Biennale, The 6th Shanghai Biennale, Busan Biennale (South Korea), The 50th Biennale di Venezia China Pavilion and exhibitions held by institutions including Tate Modern (Britain), Victoria& Albert Museum (Britain), UllensCerter for Contempory Art (Beijing, China), The Dowse Art Museum (New Zealand), Museum of Contemporary Art (Taipei), Queens Museum (USA), Vancouver Art Gallery (Canada), Power Station of Art (Shanghai, China), Arhus Kunstmuseum (Denmark), Baden-Baden Art Museum (Germany), Minsheng Art Museum (Shanghai, China), Chi K11 Art Museum (Shanghai, China), Kunstmuseum Bern (Switzerland), Today Art Museum (Beijing, China), Shanghai Art Museum (China), Guangdong Museum of Art (China), Asian Art Museum (San Francisco, USA), MoCA Shanghai, Staaliche Kunstsammlungen Dresden (Germany), Shenzhen Art Museum, Guang Dong Art Museum, National Art Museum of China (Beijing, China), Groninger Museum (The Netherlands), Museum Moderner Kunst Stiftung Ludwig Wien (Austria), Cobra Museum of Modern Art (The Netherlands), Kunst Der Gegenwart Sammlung Essl (Austria), Hamburg Art Center (Germany), Mori Art Museum (Tokyo), Irish Museum of Modern Art (Dublin), Tate Liverpool (Liverpool, London), Marseilles Museum of Contemporary Art (France), Center Pompidou (France) etc,. Liu Jianhua’s works have been collected by public insitutions including Tate Modern (Britain), Asian Art Museum (San Francisco, USA), Victoria& Albert Museum (Britain), Museum of Modern Art (New York, USA), USC Pacific Asia Museum (Los Angeles, USA), Louis Vuitton Foundation (Paris, France), K11 Art Foundation, Salvatore Ferragamo Museum (Florence, Italy),Towada Art Center (Japan), Guggenheim Museum (New York, USA), The Art Gallery of New South Wales (Sydney, Australia), Shanghai World Expo National Organizing Committee, Shanghai World Financial Center, Obra Social “la Caixa” (Spain), Today Art Museum (Beijing, China), Shenzhen Art Museum, Guangdong Museum of Art, Seoul Foundation for Arts and Culture, Queensland Art Gallery (Australia), Kawara Museum (Japan), China Club (Hong Kong, China), Coca-cola (The United States), He Xiangning Art Musem (Shenzhen, China), Yuz Art Foundation(Shanghai, China), KODE Art Museums of Bergen (Norway). Liu Jianhua is also a member of artist group “Polit-Sheer-Form Ofce.” Founded in July 2005, PSFO is Hong Hao, Xiao Yu, Song Dong,Liu Jianhua, and Leng Lin.